Powershell, Has my Dell a dangerous battery Part 2 ? on IRC (irc.freenode.net channel #Powershell ), and while discussing the script he came to the idea to get the serials direct from the Dell site. , but better yet, he posted an other real cool script Background "jobs" and PowerShell. but as I did see also some differences between his (scraped from the Dell site) and my list, see the compare below, and I think it is a very cool addition I will post it here also. I will post a complete script again to check this I made 2 options, use the current list ( I made a fresh one with the latest list with the trick below for if yyou have no internet), or it can download it from the Dell site. write-host "Battery Model : $name"
Write-Warning "Affected : Battery $Name matches : *$_*"
Note as in the other post (I forgot to mention it but )you can give also a computername to connect to a remote system. And this time I made it as a script that you can run . PowerShell, Has my Dell a dangerous battery ? Dell has started a Recall of Notebook Computer Batteries,CPSC, Dell Announce Recall of Notebook Computer Batteries. Not all Dell Batteries are Affected, so I made a PowerShell script to get the Battery Model and check it against the list of batteries so that you can check your battery easy. For more information and pointers to instructions on how to inspect your battery, and how to begin the battery exchange process, see Dell's Battery Return Program page. *Edit* in the next post Powershell, Has my Dell a dangerous battery Part 2 ? you find an example that gets te serials from the Dell site directly, also I have a new list of serials with some changes ! so check out the next post also ! I really love to work on the console by pasting in and out of the console like this while testing as its really quick as you use quickedit !! the console works great see also : Commandline editing with MSH. >> write-host "Battery Model : $name"
>> Write-Warning "Affected : Battery $Name matches : *$_*"
You can see that I do not have to paste the HashTable back in as I have it still loaded in my $global Scope, and I can just change it and past in the second line again, and now it will show the error as it will match against my battery. This method is very handy while working interactively developing or testing as you can test parts of the script just by pasting them in, as I work like this almost always you can do this with almost every example on my blog. Note that as I declare the $AffectedSerials in the function, my modified $AffectedSerials is not used so my computer will not show up as affected, but my $global scope is not changed it still contains the added value as the function runs in his own scope. A common misunderstanding is that an example like this is copied from my blog into notepad and then saved in a file. I hope this shows a bit how easy it is to test by pasting code into the console, how to work with the different examples and how the different ways of starting code differ. in later posts more about how to work with scripts. If you still have problems starting one of my examples please let me know. *Edit* note that all the Write Messages do not get passed to the pipeline so only will display on the host. PoSH>$test = "pipeline" ; write-host "Host"
write-verbose "only Host output verbose mode"
write-error "error, will raise error"
In this entry I will show how you can use a recursive script to get the all members of a group, including the members that are in nested groups. as this is the maximum the Members property will enumerate. Throw "$group is not a group"
Note that I did add the groupname as a Write-Verbose, so it will only show in verbose mode and in verbose mode will only be displayed not passed on to the pipeline , also it will show users that are member of more groups as often as they get found, as show in the examples below you can use group or sort -unique to get a list of them or to only show the users / computers found in more groups once. 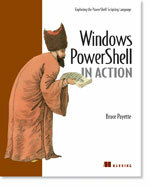 Powershell and hey Scripting guy ! one of my most favorite scripting sites is the Script Center on Microsoft teched. As I said often before on my blog especialy the scripting guys items I like very much, I follow it for a long time and and I did learn a lot from it. How Can I Use Windows PowerShell to Start a Service on a Remote Computer? How Can I Add or Subtract Two Hexadecimal Numbers? So you see that its also nice to follow the examples not in Powershell and try to find a PowerShell way, I have a lot of examples of doing that, in the series about the Scripting Games I did compete in on my blog where I did al the questions also in powerShell form (MSH at the time) as all the material and origional answers are still online here : Scripting Games Home. and the Script center has also a "what is new" RSS feed that you can use to be triggered when new examples get posted as they get metioned in the feed, hence its one of favorite feeds as well. As also I had a very busy Weekend doing a big migration at a customer last weekend, (powershell was very usefull there , not to say that it did make/save my weekend, as it enabled me to quickly do some large AD / Exchange changes and other checks of logfiles from robocopy etc . checking list of emailadresses agains the adresses in AD etc. setting some redirections on group mailboxes etc. As I do think that I could have done the status reports asked, lastminute changes, and fixes needed during the migration that quick and in a situation that was, as Jeffrey Snover would say "With my hair on fire"
So I was realy glad I could do a lot on the fly on the powershell commandline, and make small scripts on the fly to do the changes, to do that in VbScripts would be way to much work to even have tried. I think a lot of times last weekend about how difficult that would have been in VbScript and how much time I would have taken. and that I realy could not miss PowerShell anymore. I will also make a post with some examples I did use for this as I clear them up and sort them out, for a later post in the AD series. in this post we will transform the filter used in last post to a more robust function, and transform it in a more production quality script. of how the script works, better yet read the other posts in this series first! Part 5 - 7 handle the way to use CSV files or any other way to fill the PSObject with the needed properties, and this function. First about the change to a script, the Filter I used is easy to test with as you can just past it to the commandline, this version is a script that you can run directly. for another example see the changes Mike Hodnick made to an out-zip function I made before MSH out-zip Function in his blogpost here Create zip/compressed folders with Powershell to make it into a scriptas it was "but it wasn't exactly 100% usable out of the box". note the [dot][space] before the scriptpath, that makes that the function is loaded into the $global scope, otherwise it is gone again after the script ends. It is gone also if you close the PowerShell console but I load this in my profile to keep it handy. As I mostly test by pasting code into the console most of my examples are like this, so you can just past them in from my blog to test. So it both handy out-of-the box I think but in an other way and / or a different purpose. it's good to compare the 2 scripts to see wat I mean. In this case I also did choose to switch to a scriptfile to run and let it call internal functions. for some more info and another example see also : PowerShell AD site Finder this script has the same form, also the switch parameter and byRef I discuss there. For the setting "User can not change password" I did not yet discuss that in Part 3 about setting the special properties, this is actualy a ACL on the directoryentry and you can not set it using ADSI, only with the NT provider. Not to Bad right, but note that the other examples do some more checking and can set it back also, as we create new users here we do not need all this. *Edit* I decided this subject was important enough to get his own blogentry and found back some old material from when I did not have internet I did not post yet, so I will post that material here and will continue the script in next post. In the samples below you can also see how to explore the AD security from the commandline and also to check the current ACL's and remove the Access denied rules. Next post I will go on with the script, but I'm still a bit thinging about it and as said did think the ACL material was worth a own "extra" part in this series. this is a great tutorial about the security features of powershell. In this seventh part of this AD series, we will expand the filter a little,but first we need to provide the properties,so we need to fill the CSV file a bit more with the fields needed. You can just start-up excel to edit it but here I will use some more powershell onliners to fill them from the results of the export I did of some of the users I created from the adventureworks sample DB for my demosetup and did export in in PowerShell and Active Directory Part 5 , I did place get content to show what the current content is and will go on from there, using the onliners on the commandline to fill them, but you can also use the Ken Meyer user we created also in that post with the MMC and exported that onle is allready complete(for now). for more about CSV handling see more Monad scripts, and a bit more CSV and the links there for my CSV series. Ok enough CSV handling and looping tricks, lets get back AD that we are here fore and to the script to create. Write-host -fore "Yellow" "Creating $($_.name)"
$newUser.DisplayName = "$($_.LastName), $($_.FirstName) $($_.Initials)"
"Parent Found, Share $($_.HomeDir) can be created"
"$(split-Path $_.HomeDir -Parent) not Found, Create share Manual"
and we will add some more properties and errorhandling you will see the differance and use of this in next post also and work on the output. Exception setting "sAMAccountName": "A constraint violation occurred. (Exception from HRESULT: 0x8007202F)"
Exception setting "DisplayName": "A constraint violation occurred. (Exception from HRESULT: 0x8007202F)"
Exception setting "GivenName": "A constraint violation occurred. (Exception from HRESULT: 0x8007202F)"
Exception setting "SN": "A constraint violation occurred. (Exception from HRESULT: 0x8007202F)"
Note that I made one user in another OU and did not delete that user, every line will give his own error and everything is still triedand will fail we work on that also in next post, as for large numbers this is not handy but for a couple of users this doable. I think all the AD stuff was covert in former posts, so I won't explain that again here and the rest of the filter is straight forward I think, except for setting the security on the directory I covert this before in this post :Adding a Simple AccesRule to a file ACL in MSH and see the links in there for more info, so this is it for now. In this part sixth part of the AD series we will make a start of the script to import / create users from a CSV file (template generated in part 5 of this series). I will start by just echo-ing some of the properties to the screen in the first examples. in this first filter you can see that $_ contains the current item and we can access the different field from the CSV file from the object, in this case we just echo it to the screen. as we have seen in the second part of this series, all we really need to create a User is a CN, but we have also seen that the SamAccountname another mandatory property gets generated in that case and that that is not realy handy, as we most of the time want this the same as the CN name lets add a check for the property and if it's not there lets add it. As you can see, you can use this to keep the CSV file simple but extendable (you don't need to provide the samaccountname if you want it to be the same as the CN, but you CAN provide it if this is not the case ). also as my exported users had generated samaccountname properties, I did clear them all so the samacountnames will be the same as the CN. now to create the users we also need the the OU where to import the user, I will add this as a parameter to the function, but also make a check for a OU field in the CSV file to overrule this on a per user base. out-lineoutput : Exception retrieving member "ClassId2e4f51ef21dd47e99d3c952918aff9cd": "Unknown error (0x80005000)"
Note that you can just edit the CSV file but I did use select again like in the export examples in part 5 of the AD series,to show that you don't need to use the object and can nest any kind of script in in. Now we have all the properties to start lets change the script to not only echo the properties but actualy do something. Now let's create the users in the CSV file, where I will overrule the OU for one account. Thats it for now, in the next post we will add some more properties and enable them etc. as in the third part of this series.also we will add some more checking and errorhandling etc, make it into a function on the way, and will add some more functionality as creating the Homedirectory etc. as the MMC also does.